The Law Society of Kenya- Nairobi Branch, is a branch of the Law Society of Kenya tasked with improving the standards and conditions of legal practice in Nairobi and Thika regions. The Society represents about 70% of the lawyers in Kenya who make up to 6,000 active advocates. The Society has set up an Awards Programme to promote excellence in legal practice and service delivery through recognizing outstanding legal practitioners, departments and firms. 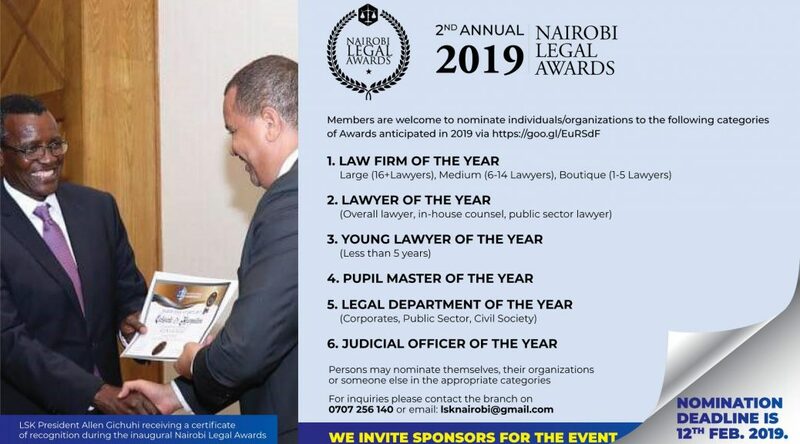 The Gala of the second edition of the Nairobi Legal Awards (NLAs 2018-19) is proposed to be held on 25th April 2019 (This date is subject to revision). Nominations and sponsors for the event are welcome.